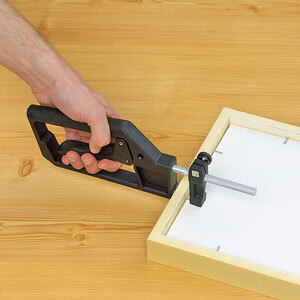 Professional tool forces brads and 5/8" framer's points into wooden frames up to 3" wide holding canvas, panels, boards, etc. Easy squeeze handle. Rubber cushion and minimum pressure prevents marring outside of frame. ® Fletcher is a registered trademark.™ FrameMate is a trademark.